At the 50-yard line of this gridiron cosmos is Al Pacino as Tony D'Amato, the embattled Sharks coach facing a full-on blitz of team strife plus a new, marketing-savvy Sharks owner (Cameron Diaz) who's sure Tony is way too Old School. 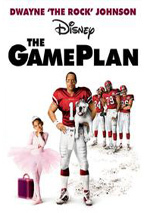 An injured quarterback (Dennis Quaid), a flashy, bull-headed QB (Jamie Foxx), a slithery team doctor (James Woods) and a running back with an incentive-laden contract (LL Cool J) also provide some of the stories that zigzag like diagrams in a playbook. Some sports seem to suit the big screen better than others. We’ve gotten plenty of great movies about boxing and baseball, but football? Not so much. That holds especially true for the pro game. When football films make an impact, it tends to be those about high school or college programs, whereas pro football doesn’t get much attention. In fact, when Any Given Sunday hit screens in 1999, it apparently became the first major movie to deal with pro football in 20 years. Though best known for his “issue-oriented” movies that generally aim at controversial subjects, Sunday offers the sight of Stone having some fun. While the story tries to be “hard-hitting” at times as it looks at some of pro football’s abuses, it’s largely a conventional tale of the old versus the new. The movie goes through a variety of subplots, but essentially it’s about balancing respect for the old with recognition of the new. Inevitably, Rooney feels hurt by the way he seems to be cast aside while Beamen lets his new-found fame go to his head. Stuck in the middle of this all is head coach Tony D’Amato (Al Pacino), another aging veteran who wonders if his best is behind him. His situation gets complicated by the “win at all costs” pressure of team owner/general manager Christina Pagniacci (Cameron Diaz); this young fire-brand wants to make a name for herself and provides an abrasive, unsentimental presence. By the end of the film, most of the parties’ stories wrap up with such heart-warming cleanliness that I thought Frank Capra stepped in to finish the movie. Really, though Stone uses modern filmmaking techniques with his trademark quick-cutting and a wide variety of visual styles, it’s an old-fashioned tale. The vet gets to go out with self-respect intact, the kid learns humility and the value of playing for the team, and the coach receives renewed life and vitality through all the experiences. The bad get punished and everyone goes home happy. Sunday provides a predictable story that becomes mucked up with too many needless subplots - it features an overabundance of characters - but I still like it in the long run. Sunday works mainly because Stone doesn’t try to reinvent the wheel. The subject matter offers nothing new, and while Stone’s hyperactive visual style provides some semi-fresh kicks, I never feel like any form of innovation occurred here. And I don’t care. Very few movies come across as unique or original, so the telling of the tale becomes most important. Sunday delivers a professional and entertaining effort that drags at times but usually remains exciting and compelling throughout its 157-minute running time. Stone hasn’t created a classic but I think it’s one of his more consistent and enjoyable works. The solid cast certainly helps. Pacino remains in his usual “hoo-hah” mode, but for all his bluster, he still gives us a strong, engaging presence. Foxx effectively portrays the variety of emotions Beamen experiences, and Quaid makes for a believable pro. Diaz does the best work of the bunch. Diaz proves her acting chops as she stands up to the big boys and seems solid. She gets an unsympathetic character and makes her live and breathe during her somewhat limited screen time. I won’t say her performance delivers a revelation, but it shows she can take on roles beyond her usual comedic milieu. I do have a few miscellaneous complaints about Sunday. Because the NFL wouldn’t extend support for the film - too many controversial subjects like drug use - the movie creates its own league, the AFFA. I don’t recall hearing the acronym explained in the film; an article called it the “Association of Football Franchises of America”, but I’d like to think of it as the “American Fantasy Football Association”. While I understand the need to create this fictional league, Stone makes one major misstep when a character refers to the NFL’s Dolphins. This touch of realism actually makes the story less believable. If the movie offers the AFFA as a fake version of the NFL, I could accept it; I’d understand the need for the fictional teams and would simply regard the AFFA as an alternate universe’s NFL. I can’t make that leap. While I don’t think this stretch of reality makes it impossible or even difficult for me to enjoy Sunday, it does affect my suspension of disbelief. The introduction of the NFL causes me to be more critical of other aspects of the film’s factual basis, and this takes me out of the story at times. Which leads me to my second criticism of Sunday. If you watch this disc’s supplements, you’ll hear Stone and others discuss their devotion to realism. If so, why does the movie feature so many dopey mistakes? Scoreboards credit extra points before they occur. A player refers to how it feels to have eleven guys stare back at him in a huddle; unless he has an out of body experience, only ten people facing him in a huddle. A player gets a monetary bonus for reaching certain statistical levels; however, he doesn’t get to that point until the playoffs, and stats don’t count toward regular season totals at that time. There are also some continuity errors related to scoreboards, but I don’t worry too much about those, as they may have reflected changes in the production. However, I think the other various mistakes disrupt my involvement in the story. In another instance, the team’s owner says she can trade Cap for two high draft picks – and then almost immediately indicates she wants to cut him in the off-season and give him a front office job. Huh? These errors create small fissures in the overall impact of the story and make it harder for me to accept the film’s world – especially since Stone and company want us to believe they’ve made a hard-hitting “accurate” movie. Despite those gaffes and an occasionally over the top visual style, Any Given Sunday brings us a pretty entertaining film. It’s not art but it keeps us with it. 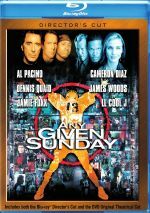 Any Given Sunday appears in an aspect ratio of approximately 2.40:1 on this Blu-ray Disc. The movie came with a decent but erratic presentation. Sharpness provided one of the up and down elements. Much of the movie showed good clarity and accuracy, but exceptions occurred, as some shots could be a bit soft and tentative without obvious reason. I saw no issues with jagged edges or shimmering, and the image lacked edge haloes. Print flaws also failed to mar the transfer most of the time; I saw a handful of small marks but nothing substantial. In terms of palette, Sunday favored a prominent orange tint. This came through reasonably well given the stylistic conceit, though I thought the hues could seem a bit oppressive and not as clear as I’d like. Blacks were fairly deep, and shadows showed pretty good clarity. With its inconsistencies, the image ended up as a “B-“. As for the film’s DTS-HD MA 5.1 soundtrack, it helped translate the violent action of the game to the home theater environment. While the surrounds mainly bolstered the front channels, they did so well and they contributed a fair amount of unique audio. The mix did a decent job of engulfing the viewer with loud, overstated football effects and a combination of aggressive rap and rock music. Quality generally appeared positive as well. Due to Stone’s style, some dialogue got lost in the mix, but I felt certain this was intentional. Overall, speech sounded crisp and fairly natural, with no issues related to intelligibility. Lines could be a little metallic at times, though. Effects were distinct and they packed a nice punch - literally. Whether the exaggerated crunch of the tackles, the roar of the crowd, or the sound of a buzz saw destroying a car, all of these aspects of Sunday seemed clear and lacked any prominent signs of distortion. Music appeared bright and dynamic as well, with clean highs and solid bass. This became a pretty solid mix. How does this Blu-ray compare with the Special Edition DVD from 2000? Audio was peppier and fuller, while visuals appeared more distinctive and vivid. Even with my criticisms of the visuals, the Blu-ray still marked an improvement over the DVD. Most of the DVD’s extras repeat here, and we find two separate audio commentaries. For the first, we get a running, screen-specific chat from director/co-writer Oliver Stone. He discusses story/character areas, conflicts with the NFL, cast and performances, sets and locations, shooting the football scenes, music, cinematography and visual design, editing and deleted segments, and other topics. I usually find Stone to offer interesting commentaries; even when he blathers about his pet obsessions, he remains compelling. That proves less true than usual here, as his Sunday tracks tends to falter too much of the time. Stone works best during the movie’s first 45 minutes or so, as he gives us a decent area of insights and observations. As the movie progresses, though, he tends to narrate the story, and he goes off onto tangents that offer little in the way of useful material. Stone’s ample ego also gets in the way; he likes to boast about the movie and his own special qualities, such as when he claims he would’ve been a good general and would’ve done better in WWII than Eisenhower! A little Stone can go a long way, and this becomes an erratic commentary. For the second commentary, we hear from actor Jamie Foxx. He provides a running, screen-specific look at cast and characters, sets and locations, shooting the football scenes and related areas. I used to look forward to actor commentaries, but now I usually dread them, and Foxx’s chat reminds me why: they mostly stink. Though Foxx throws out a handful of interesting anecdotes, mostly he just tells us vague thoughts without merit – when he talks, that is. Plenty of dead air abounds in this slow chat. It’s a tough one to stay with in the long run; Foxx gives us so little information that I suspect most fans will bail on the commentary well before the movie ends. Although his commentary can be rather spotty and suffers from quite a few blank spots, Foxx offers some generally interesting remarks. Actually, his track seems erratic and could drag at times. However, he redeemed himself when he discussed his research into the lives of real players; on those occasions, Foxx brought a compelling perspective to the discussion. It’s not a great track but it deserves some attention. When I watched “Contact” in 2000, I thought it offered a good look at the film. In 2014, I wonder what the heck I was thinking 14 years ago. “Contact” consists of little more than praise for Stone and the film, along with ridiculous comments like Stone’s claim his view of the action will ruin real football for us. This is a pretty useless piece. After this we find Jamie Foxx Audition Tape and Screen Tests. We get his “Football Home Video (Audition Tape)”, which essentially provides three minutes and 21 seconds of Foxx throwing a football. We also find two screen tests: “The Lunch” (1:17) and “Willie and Vanessa at the Cordoza Hotel” (2:01). All are fun little looks at the casting process. We also find three music videos. LL Cool J’s “Shut ‘Em Down” (3:38) seems mildly interesting but sticks to the usual lip-synch/movie clip formula and offers nothing special. The other two videos feature Foxx. We get “My Name Is Willie”, a one-minute and 47-second piece that slightly expands upon the faux-video shown in the film, and “Any Given Sunday”. The latter lasts three minutes and 25 seconds and combines some scenic film clips with archival football footage. It’s darned dull. 14 Deleted/Extended Scenes fill a total of 32 minutes, 39 seconds. These clips can be watched with or without commentary from Stone. Normally I view the scenes with the production audio first and then check them out with commentary, but in this case, you may as well check them out with Stone’s remarks during your initial viewing. He adds no statements for the first three scenes and only contributes a few tidbits for segments four, six, eight, ten, eleven, twelve, thirteen, and fourteen; even when he does speak, he offers surprisingly little information. A Gag Reel runs for four minutes and 11 seconds. This mixes some flubs with a fair amount of improvising. As such, it’s more fun than the usual goofs reel, especially during a great snippet in which Pacino and Woods chat on a plane trip. More unused footage appears during the Football Outtakes Montage. This eight-minute and 28-second piece mainly consists of fairly generic game footage, but we also get some player and coach interactions as well. The latter make the section more interesting and fun. The final area that offers unused material is called Miscellaneous Landscapes and Outtakes Montage. This three-minute and 26-second section includes the most stylized footage as we find lots of slow-motion game shots plus some exteriors. It’s the least compelling of the bunch but it still merits a look. The Art of Selling shows us the posters used to advertise Sunday and it also lets us see a slew of unused concepts. The still frame presentation goes through 21 screens of ads; most of these display three posters per screen, but the first five show only one ad. I like this glimpse at the design process. Stills Gallery offers 122 photos. We get a nice mix of shots from the set, publicity pictures, and stills from the production. In addition to the film’s trailer, we locate a documentary called Anything Can Happen. In this 30-minute, one-second piece, we hear from Stone, NFL Unplugged author Anthony L. Gargano, Tailgating, Sacks and Salary Caps author Mark Yost, Bloody Sundays author Mike Freeman, and former NFL personnel Shawne Merriman, Amani Toomer, Willie McGinest, Jerry Rice, Jim Fassel, George Martin and Tim Green. “Happen” looks at aspects of the movie production as well as reflections on the NFL and developments since 1999. Some of the comments from former players add interest and “Happen” tops the near-useless “Contact” but it’s still not an especially insightful show. A second disc provides a DVD copy of Sunday. While the Blu-ray gives us Stone’s “Director’s Cut” (2:37:11), the DVD includes the movie’s original theatrical version (2:43:18). I believe this represents the theatrical cut’s first appearance on DVD or Blu-ray. It’s too bad the original version gets relegated to a standard DVD; it would’ve been nice to view it in hi-def. Like all of Oliver Stone’s movies, Any Given Sunday comes with a number a variety of flaws. However, it remains an interesting and generally fun film that provides a ridiculous but enjoyable look at America’s favorite sport. The Blu-ray provides erratic visuals along with good audio and a long but inconsistent set of supplements. Both Blu-ray and movie seem positive despite some flaws.